394 Marlborough is located on the south side of Marlborough, between Hereford and Massachusetts Avenue, with 392 Marlborough to the east and 396 Marlborough to the west. 394 Marlborough was designed by architect Samuel D. Kelley and built 1885-1886 by building contractor John W. Shapleigh, for speculative sale, one of three contiguous houses (390-392-394 Marlborough). He is shown as the owner of 394 Marlborough on the original building permit application, dated April 6, 1885, and on the final building inspection report, dated October 29, 1886. 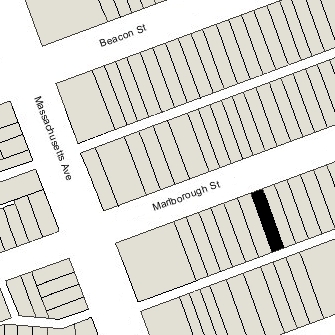 Click here for an index to the deeds for 394 Marlborough, and click here for further information on the land on the south side of Marlborough between Hereford and Massachusetts Avenue. On October 6, 1886, 394 Marlborough was purchased from John Shapleigh by Harriet P. (Learned) Lamkin, the wife of boot and shoe dealer Guy Lamkin. They previously had lived in West Newton, where they continued to maintain a home. Harriet Lamkin’s unmarried brother, William Henry Lamkin, lived with them. He had been a shoe dealer until about 1888 and later became president of the North National Bank. He died in June of 1891. Guy and Harriet Lamkin continued to live at 394 Marlborough during the 1898-1899 winter season, but moved thereafter to Newton Centre. Harriet Lamkin continued to own 394 Marlborough and lease it to others. By the 1899-1900 winter season, 394 Marlborough was the home of stockbroker Rogers Lewis Barstow, a widower, and his sister, Eliza Barstow. They previously had lived at The Charlesgate at 535 Beacon. During the 1879-1880 winter season, they had lived at 388 Beacon, where his wife, Sarah C. (Baker) Barstow, had died in December of 1879. Rogers and Sarah Barstow’s unmarried children, Alice R. Barstow and Ezra Baker Barstow, lived with him at 394 Marlborough. He also maintained a home in Mattapoisett. They continued to live at 394 Marlborough during the 1902-1903 season, after which they moved back to The Charlesgate. The house was not listed in the 1904 Blue Book. By 1905, 394 Marlborough had become medical offices and a lodging house. It was the home of Margaret Preston (Campbell) Dunlop, the widow of John Dunlop, who probably was the lodging house operator. She previously had lived at 374 Newbury. She continued to live at 394 Marlborough in 1909, but moved thereafter. Among the lodgers at 394 Marlborough from 1905 through 1909 was Dr. Robert Patrick Fair. By 1910, he had moved to an apartment at 481 Beacon. By the 1909-1910 winter season, 394 Marlborough was the home of Ernest Albert Long, a railroad freight yard foreman, and his wife, Sarah (Eadie) Long. They operated it as a lodging house, with 13 lodgers listed in the 1910 US Census. They previously had lived in Charlestown. They moved soon thereafter to Bethlehem, New Hampshire, where he later became a judge. By the 1910-1911 winter season, 394 Marlborough was the home of Miss Mary J. McDonough and her unmarried brother, Timothy McDonough. Mary McDonough continued to operate the property as a combination of medical offices and a lodging house. Guy Lamkin had died in June of 1905, and Harriet Lamkin died in February of 1911. On February 14, 1912, her estate transferred 394 Marlborough to their daughter, Charlotte (Lottie) Maud Lamkin. She lived in Newton. In October of 1922, Lottie Lamkin was cited by the Building Department because 394 Marlborough lacked the egress required for a lodging house. On February 7, 1924, 394 Marlborough was acquired from Lottie Lamkin by Mary McDonough and her sister, Honor McDonough. In August of 1925, Mary McDonough applied for (and subsequently received) permission to remodel the interior, including providing connecting balconies for egress. The work was not completed, however, and the permit was abandoned. Timothy McDonough died in March of 1931 and Mary McDonough died in January of 1932. 394 Marlborough became the home of Honor McDonough, who previously had lived at 76 Bay State Road, where she had operated a lodging house. 394 Marlborough continued to be medical offices and a lodging house. Honor McDonough continued to live there until her death in June of 1936. On October 1, 1936, Tanette Otis Bacchi of Rome, Italy, foreclosed on a mortgage she held on 394 Marlborough as trustee of a trust she had established in 1921 to manage her inheritance from her grandmother, Eliza Henderson (Bordman) Otis, the wife of Harrison Gray Otis. On January 25, 1937, 394 Marlborough was acquired from Tanette Otis Bacchi by real estate dealer H. Herbert Dearing of Brockton. On March 30, 1937, 394 Marlborough was purchased from H. Herbert Dearing by Elizabeth Florence (Clarke) Lambert, the widow of Edward Thomas Lambert, who operated it as medical offices and a lodging house. She previously had lived at 21 St. Botolph. 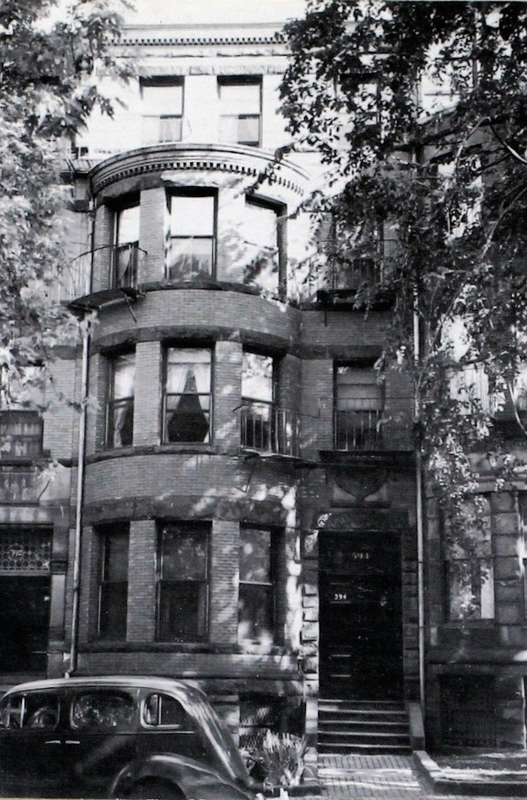 By 1939, she had moved to 1307 Commonwealth in Allston, where she operated Allston Realty. She continued to own 394 Marlborough, which remained a lodging house. In May of 1941, she was cited by the Building Department for operating a lodging house at 394 Marlborough without providing sufficient egress. On August 12, 1943, 394 Marlborough was purchased from Elizabeth Lambert by Mary (Roulstone) Ott, the widow of Dr. George J. Ott, and on September 17, 1943, she transferred it to her son, Lawson Roulstone Ott. They both lived at 344 Commonwealth. In March of 1944, he applied for (and subsequently received) permission to legalize the occupancy as medical offices on the first floor and a lodging house on the upper floors. In conjunction with his application, he provided affidavits from Dr. Henry Hawkins, indicating that he had maintained his offices there for thirty years, and Dr. Ralph H. Ruggles, indicating that he had maintained his offices there for nineteen years. Lawson Ott and his mother moved to 394 Marlborough in about 1944. She died in October of 1944; he continued to live there until about 1947. On September 18, 1947, 394 Marlborough was acquired from Lawson Ott by retired auto mechanic Henry Berg, a widower, who operated it as a lodging house. He previously had lived at 56 Temple. He continued to live there until about 1955. On March 3, 1955, 384 Marlborough was acquired from Henry Berg by attorney Harold Parritz as trustee of the Hone Realty Trust. On April 7, 1955, he transferred the property to his wife, Nancy Sue (Seder) Parritz, and on June 27, 1956, she transferred the property back to him as trustee of the Prudential Realty Trust. On October 30, 1959, 394 Marlborough was acquired from Harold Parritz by Richard H. Rubin. That same month, he applied for (and subsequently received) permission to convert the property from a lodging house into ten apartments. On December 1, 1959, he transferred the property to himself as trustee of the Copley Realty Trust. The property changed hands and on January 30, 1978, was acquired by Donato F. Pizzuti and Russell L. Peterson, trustees of the Stanton Realty Trust. On October 10, 1981, 394 Marlborough was acquired from the Stanton Realty Trust by Russell L. Peterson as trustee of the 394 Marlborough Street Realty Trust. 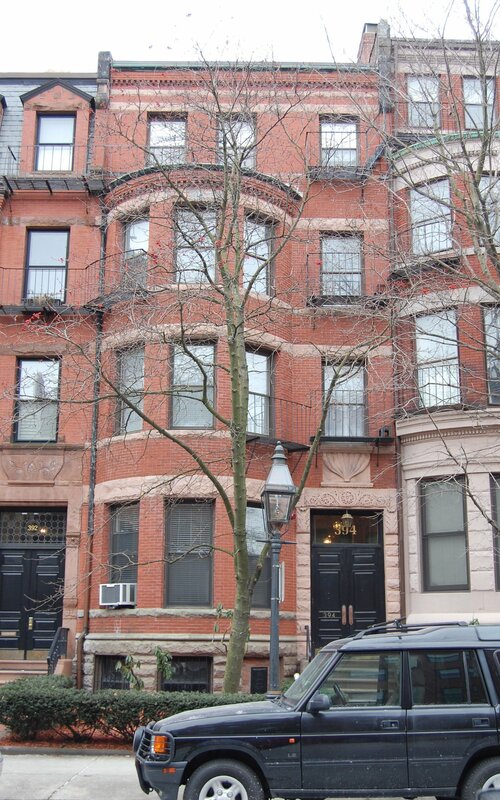 On January 28, 1982, he converted the property into ten condominium units, the 394 Marlborough Street Condominium.